Marianne is a native of Houston, Texas. In 1989, she founded Project Angel Food, a meals-on-wheels program that serves homebound people with AIDS in the Los Angeles area. To date, Project Angel Food has served over 11 million meals. 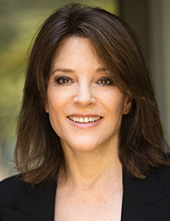 Marianne also co-founded the Peace Alliance. Marianne has dedicated her travel schedule during 2018 to the Love America Tour, articulating an evolutionary wave of new possibility as principles of higher consciousness are brought to bear on our politics.